A terrifying new book by James Bridle calls on us to embrace uncertainty. Credit: Flickr/opensource.com. CC BY-SA 2.0. Data is making us dumber. This seeming paradox has been gaining currency, at least in the tech-saturated Global North. We’re increasingly bombarded with advice on how to manage data overload. The English comedian Dave Gorman summed it up in the tongue-in-cheek title of his recent book: “Too much information: Or: Can Everyone Just Shut Up for a Moment, Some of Us Are Trying to Think.” We like to laugh about this stuff. It helps us to cope with the deep human fear that the world has moved beyond our understanding and control. If indeed we’re in a state of hysterical denial, James Bridle wants to give us all a slap in his forthcoming book “New Dark Age: Technology, Knowledge and the End of the Future.” Bridle invites us to engage in a direct confrontation with our decreasing comprehension of the world. Through a wide investigation of diverse fields from aviation to social media, the pharmaceutical industry and climate science, he sets out to show how our data-driven culture is threatening our existence as a species. It’s an intriguing and unsettling proposal. As a journalist, technologist, and visual artist, Bridle has employed a multiplicity of strategies for thinking differently about technology. He’s still probably best known for developing what he called the “New Aesthetic” in 2011, now an art meme centred around a tumblr account that captures the physical objects and signs of the digital world like data centres or surveillance drones. While the New Aesthetic makes the invisible visible, ‘New Dark Age’ appears to ask us to think the unthinkable. If you don’t like paradoxes, buckle up and hold on tight. The book is not an easy read. In fact, Bridle admits it was a struggle to write. “There is a kind of shame in speaking about the exigencies of the present, and a deep vulnerability, but it must not stop us thinking. We cannot fail each other now” as he puts it. This shame and vulnerability spring from an inconvenient truth: our faith in data is failing us. More information is supposed to lead to better decisions, a cultural logic that has dominated the Western world at least since the Enlightenment. The warning that this relationship is breaking down, or perhaps is already broken, is being flagged across multiple disciplines. What Bridle attempts to do is to bring them all together. The picture he paints is a daunting one. We learn that experts are drowning in data. There’s been an increase in data-dredging, where researchers cherry-pick the results they need, even if unwittingly. The pharmaceutical industry is experiencing a discovery crisis, returning exponentially fewer breakthroughs in new drugs. The intelligence services tell the same story. In 2016, NSA whistle-blower William Binney said that the bulk collection of communications data was “99 per cent useless,” one of many such statements in recent years. It’s not only that data can swamp and mislead us; it also provides such a compelling picture that we often reject our common sense. Bridle provides a string of nightmarish examples of what is known as “automation bias,” including tragic airline accidents and a group of Japanese tourists who—following their SatNav in Australia—drove their car straight into the sea. Most of us have made absurd mistakes because of trusting machines more than ourselves. Most harrowing of all is his chapter on climate. “The climate crisis is also a crisis of knowledge and understanding,” Bridle writes, “What we perceive as weather in the moment shadows the globe as climate: tiny moments of turbulent activity through which we can barely grasp an unseen, unknowable totality.” Our forecasting systems are already failing in the face of unpredictable climate events. If data aren’t helping us, we’d better get used to extreme levels of uncertainty as the norm. Thus climate becomes the grand metaphor for our overwhelming loss of knowledge and control. But instead of running for the hills (and hoping they haven’t sunk into the sea), Bridle suggests that we embrace the “cloudy thinking” that springs from this loss of certainty. The problem is, we’re addicted to this way of thinking. Bridle compares our “thirst for data” to our “thirst for oil”—insatiable and ultimately destructive. It’s a shaky metaphor, as he seems to acknowledge later on. Information, unlike oil, has the potential to be a free, infinite resource. However, today it’s anything but. Current data consumption habits carry a high environmental cost. As Bridle points out, “As digital culture becomes faster, higher bandwidth, and more image based, it also become more costly and destructive." However hard it may be to change this culture, it seems at least possible to slow ourselves down. Books like the recent best-seller “The Organised Mind: Thinking Straight in the Age of Information Overload” by the neuroscientist Daniel Levitin are popular because they offer individuals practical advice on how to do just this. They also propose strategies for how to navigate our data-rich world more effectively. 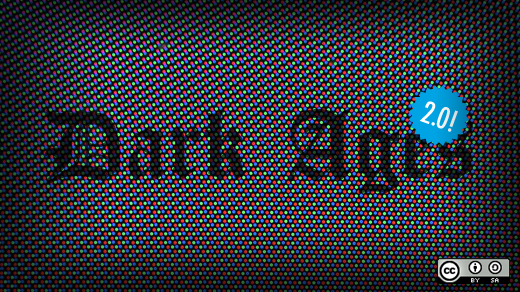 “New Dark Age” also deals with this challenge. Parallels have often been drawn between the internet and ‘The Library of Babel,’ an infinite library imagined in an iconic short story by the Argentininian writer Jorge Luis Borges. Bridle engages this metaphor to call for new and radically different “categories, summaries and authorities” that can help us utilise the sum of our interlocking information systems. He uses the term “literacy” to mark the difference between full comprehension (which is impossible) and learning how to speak the language of the network. But who decides on this navigation system—who are the new librarians? The latest backlash against Big Tech, sparked in part by the Cambridge Analytica scandal, may die down, but nothing fundamental is likely to have changed. Facebook, Apple, Google and Amazon will still remain hugely powerful and largely unregulated gatekeepers of the ‘infinite library.’ They have shown, time and again, that they don’t deserve our trust. This brings us back to the theme of uncertainty. Humans are afraid of the darkness for a reason. We’re especially afraid if we’re blind-folded and others around us are able to see. This is where Bridle’s thinking hits a familiar brick wall. Elsewhere in the book he acknowledges that technology is “a key driver of inequality across many sectors” and that one of the main reasons is “the opacity of technological systems themselves.” We all know that knowledge is power. Historically, those that lack it are always exploited by those who possess it. It’s an intoxicating quote, but what are we to make of such ‘peace and safety’? Surely Lovecraft knew that, when human beings are faced with darkness, they fill it with irrational belief? In the history of Europe, the early medieval period is often called the “dark ages:” centuries marked by religious war, civil conflict and civilisational decline. The more apocalyptically-inclined might see parallels with our own post-truth age, since our societies appear to be polarizing and re-affirming the old certitudes of tribe, race and nation. The Brexit vote in the UK and the election of US President Donald Trump are only the latest symptoms of a trend that feeds off our chronic sense of unease. Bridle explores this political moment, but he doesn’t offer a convincing reason why people would choose his ‘productive uncertainty’ over the darkness that is manipulated by profit-hungry corporations, extremist groups and troll farms. Here’s another Lovecraft quote: “The oldest and strongest emotion of mankind is fear, and the oldest and strongest kind of fear is fear of the unknown.” In asking us to overcome this fear, Bridle seems to be courting the impossible. Yet “New Dark Age” does hit a nerve. If indeed we’ve passed ‘peak knowledge,’ it’s time to look despair in the eyes. Bridle makes a brave attempt to break through this existential impasse. Whether or not he succeeds, his book provides a fascinating and a much-needed spur to action. “New Dark Age” by James Bridle is published by Verso Books.